Researchers from the ETH Zurich’s Department of Biosystems Science and Engineering (D-BSSE) have devised a new method for preventing and permanently eradicating the cause of gout. It involves implanting a molecular prosthesis consisting of a biological network that regulates the uric acid levels autonomously. As Paracelsus once stated, the dose makes the poison. This not only goes for chemical substances introduced to the body, but also those produced by it. The uric acid in the blood especially needs to be in the proper dosage. If the level is too high (i.e. above 6.8 mg/dl blood), the uric acid crystallizes out, which can cause kidney stones and gout. However, uric acid is an important part of the human detoxification system, acting as a socalled “scavenger” of free radicals, which cause neurological disorders, brain diseases and tumors. A team of researchers headed by Professor Martin Fussenegger from ETH Zurich’s D-BSSE in Basle has now succeeded in building a network of genes which permanently keep the uric acid concentration in check. The preliminary trials in mice have been encouraging. The research results were published in the journal Nature Biotechnology. In most mammals, the enzyme urate oxydase controls the uric acid level. As humans evolved from the apes, however, they lost this enzyme, which is why we suffer more from an elevated uric acid concentration. Researchers from ETH Zurich set about finding a way to rectify the defect and restore the subtle control of the uric acid level. With this in mind, they put together a biological network of genes called UREX. The individual components of UREX were “programmed” differently by the researchers: a uric acid sensor constantly gauges and controls the concentration in the blood. If the uric acid level reaches an alarming concentration, the sensor relays the information to a genetic circuit. This then makes sure that the third component of the network releases the correct amount of urate oxydase into the blood and that the uric acid level is restored to a healthy balance. The three components of the network thus communicate with each other and work independently and automatically — without any external assistance. The uric acid level can therefore be controlled permanently using UREX. The gene network is integrated in a single cell. Around two million of these cells are enclosed in a seaweed gelatine capsule measuring 0.2 mm in diameter to protect the cells against an immune response. Pores in the capsule ensure that the cell receives an optimal supply of nutrients, the uric acid level can be gauged by the sensor and the enzyme can find its way into the blood. However, the organism does not come into contact with the network’s modified genes. Even if the method were used in humans, a direct intervention in the patient’s genetic make-up would not be necessary. “In the case of diseases resulting from genetic defects, it might make sense to channel genetically modified material directly into the human cells. However, this also raises concerns as the material can no longer be removed”, explains Martin Fussenegger. But this is not the case with the new method: the implant can be removed safely at any time and without any after-effects. For the ETH-Zurich professor, the result is a prime example of what the relatively new research branch of synthetic biology can achieve: “Many medical problems are solved by introducing chemical substances, i.e. medication, into the body from outside. In our method, we repair a defective metabolic pathway and help the body to treat itself in the best possible way.” Martin Fussenegger refers to it fondly as a “molecular prosthesis” — an artificial aid that compensates for the evolutionary lack of urate oxydase. Around 1 % of the population in the industrialized countries suffers from the extremely painful joint disease gout due to elevated uric acid levels. There are many causes for the increase in the uric acid level: a genetic predisposition, environmental influences or an unbalanced diet. Moreover, it can lead to so-called tumor lysis syndrome after chemotherapy. Due to the intervention, tumor cells disintegrate so quickly that too much uric acid finds its way into the blood. This results in metabolic complications and possibly renal failure. 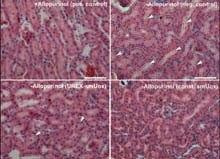 The team of researchers from ETH Zurich has successfully tested the UREX network on mice: as expected, the uric acid concentration in the blood decreased to a stable and healthy level, and the uric acid crystals in the animals’ kidneys dissolved. The researchers have already filed a patent application for the network, but the next steps for its medical application are now in the hands of other partners. “We’re confident that our network will complete all the necessary series of tests in the not too distant future, but in our experience it takes longer than you might hope for a finished product to reach the market”, cautions Fussenegger. Once this one does, however, gout and kidney stones will be a thing of the past. Synthetic biology is a new branch of research that has only really emerged from an amalgamation of various disciplines in the last five years. Researchers from molecular biology, organic chemistry, engineering, nanobiotechnology and in-formation technology team up to develop novel molecules and proteins. The aim is to program entire cell systems in such a way that they can assume organ functions. Much like engineers who design successful, more efficient vehicles or computers from individual components, synthetic biology endeavors to improve the individual components of a complex biological system and hone them for new therapeutic purposes. This opens up a wide range of potential applications. ETH Zurich recognized the potential of this research area and founded the Department of Biosystems Science and Engineering especially with this in mind. The vision of ETH Zurich’s youngest department is to establish itself globally as a center for synthetic biology.